Preheat oven to 170C/ gas mark3. Lightly grease a doughnut pan with oil. Add the spinach to a pan and heat until wilted. Run under cold water to refresh, drain and squeeze out excess moisture. Puree well with a hand held stick blender. Zest and juice the lemon, then set aside. They will be used for both the batter and glaze. In a large bowl, beat the spinach puree, 1 tsp of zest, 1 tbsp of lemon juice, sugar, milk, cooled melted butter, egg and vanilla together. Sift in the flour and baking powder and gently combine. Fill the doughnut moulds with the batter until nearly full and bake for 15 minutes or until springy and an inserted skewer comes out clean. Allow to cool in the tray for 5 minutes, then carefully remove from the pan to cool completely on a wire rack. Mix the icing sugar with 1 ½ tbsp of the lemon juice. Add more juice (or water), sparingly, if needed to achieve a thick but pourable consistency. 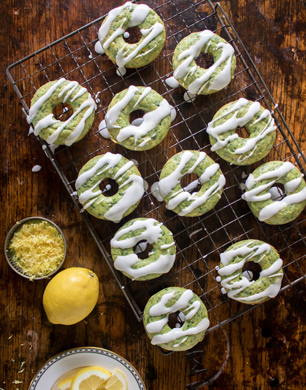 Drizzle over the completely cooled doughnuts and sprinkle with a little zest.